Say you and your spouse are in your late 20’s. You have two beautiful children. You earn just over RM5,000 a month – barely enough to cover your car loan, groceries, utilities and other expenses. You’ve delayed buying a house and are renting a 3-bedroom, 900 sqft apartment for RM1,250 a month. How can FundMyHome help you buy a home? First up, it offers a variety of homes to suit your family’s needs, Now, let’s say you choose a newly-built apartment costing RM300,000. Under FundMyHome, you need to pay just 20% of the purchase price to secure your home. FundMyHome will help raise the balance of 80% from institutions. You can take a 5-year personal loan of RM60,000 at 5% p.a. Once the buying process is completed, including vacant possession, your family can move in. Yes, you will still need to pay RM1,250 to service your personal loan. But the big difference is, while previously you paid rent, your monthly payments now go to building up your equity. If you service your loan promptly each month, it will also improve your credit rating. Your family enjoys the security of living in your own home, without worrying about rental increases or the landlord asking you to vacate. At the end of five years, you will have equity worth RM60,000 in a home under your name. If you had continued to rent, you would have nothing to show for the 5 year’s worth of rental paid. Isn’t retirement wonderful? You have your own home, with your pension and savings to meet your simple needs. But one worry keeps you up at night – your 28-year old daughter still hasn’t managed to buy her own home. Despite graduating with an accounting degree and securing a good job, the cost of food, transportation, clothing and some simple entertainment eats up all of her salary, crippling her ability to buy a home. You want to help secure her future and are willing to make the downpayment on a nice property in an accessible location. 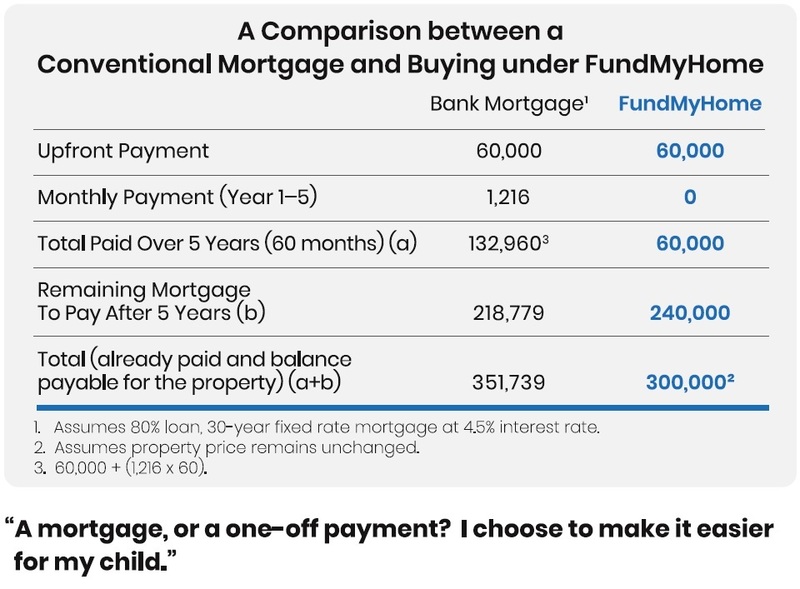 But the question is – should she opt for a conventional 30-year, fixed-rate mortgage at 4.5% interest or FundMyHome? Let’s compare, using a 3-bedroom apartment costing RM300,000 as an example. Under both financing options, your daughter would need to pay RM60,000 upfront towards 20% equity in the home. A bank lends the remaining 80%, burdening your daughter with a mortgage of RM1,216 in monthly repayments. FundMyHome, on the other hand, raises the balance of 80% from institutional investors. There are no monthly payments under FundMyHome. By the end of the fifth year, your daughter would have paid a total of RM132,960 under the mortgage arrangement which largely went to interest. With FundMyHome, she would have paid nothing beyond the initial RM60,000. 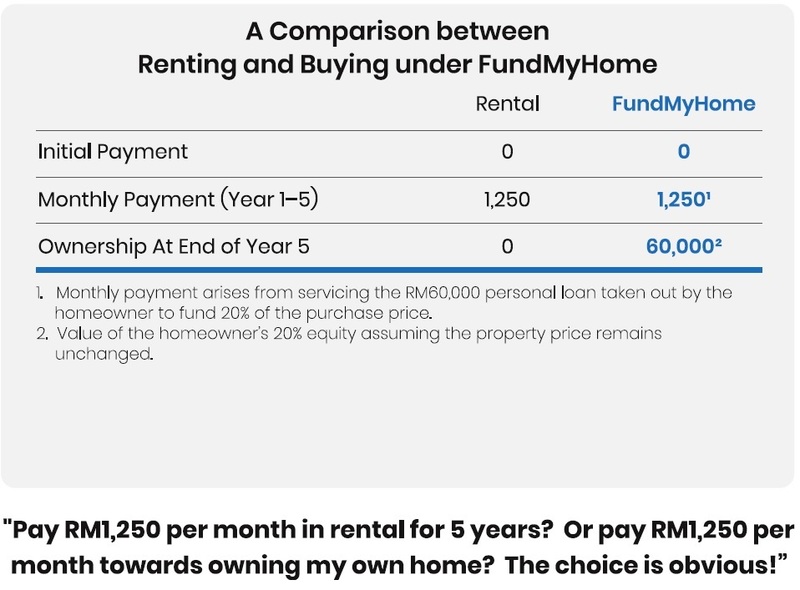 After year 5, the amount already paid and balance payable to own the property would be RM351,739 under a bank mortgage against only 300,000 under FundMyHome. You are RM51,739 better off under FundMyHome. Which option would you choose for your child? Click here to get even more details!